All the style of a Sports Utility Vehicle. All the practicaity of a family hatchback. 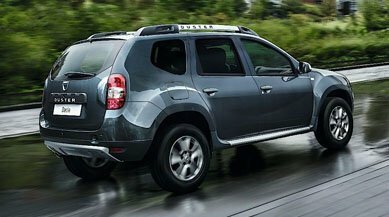 Enjoy the best of both worlds with the new Sandero Stepway crossover. Its raised ride height gives you a commanding view of the road ahead. Its black wheelarch extensions, side sills and front and rear scuff plates make it every inch a robust SUV. Yet there's a suave and sophisticated side to those rugged good looks : 16" 'Stepway' design wheels, satin chrome roof bars and a choice of four optional stunning metallic colours give Sandero Stepway an assured presence about town. Off-roader style no longer means off-roader running costs. Sandero Stepway offers a choice of two frugal engines, which blend brisk performance with exceptional fuel efficiency and low CO2 emissions. Using turbocharging technology, the state-of-the-art TCe 90 petrol engine generates an impressive 90hp from just 3-cylinders, yet achieves 52.3 mpg*. Or,for ultimate cruising ability, choose the dCi 90 turbo-diesel engine, which achieves 70.6mpg* and emits just 105 g/km of CO2. So, you really can enjoy the best of both worlds. With prices starting from just £8,995** on-the-road, Sandero Stepway ia a crossover at supermini prices. Choose from two simple versions : the stylish and affordable Ambiance or luxurious Laureate, complete with MediaNav touchscreen navigation, air conditioning and rear parking sensors as standard. Sandero Stepway. SUV style. Supermini cost.